When it comes to designing and putting together a new office space there are a number of things that you need to take into consideration, and of course this is true regardless of whether you’re putting together an office building or a home office. While the requirements might differ slightly the basics remain the same, and the process of putting together a new office can certainly be a stressful experience. As with many things we do, it can be easy to miss something, or forget something that we probably do need; for which purpose this checklist should help you through the various stages of designing and putting together an office environment for your needs, regardless of what those specific need might be. Before you actually start putting a new office together and moving in the furniture you need to consider the space available and how it will be used. There are a number of questions on this subject that you’re going to have to think about before you can start. How many people will occupy the office? Consider what the maximum capacity of the space is going to be and how many people are going to have to work in the office on a daily basis. What will each person need? You should think about how much space each person needs and what equipment they will have to have access to, as well as how much space that equipment will take up. What are the needs of the people who will be using the space? Do they need privacy and quiet? Or is a social environment more suitable. 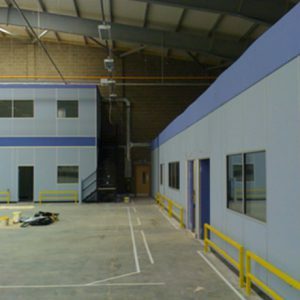 If you’re unable to offer private offices to those who need a quieter area to work in then you will need to look more carefully at the number of people in each space and partitioning between them. Also take into account the placement of noisy equipment in the office. When it comes to office furniture there are no sure-fire answers, as your needs and the needs of each of your employees will have a massive bearing on your options, and the space available will certainly play a part in the decisions. Desks. If your employees are going to be working phones all day or working with computers for considerable lengths of time they’re going to need desks. Even if they’re working in a heavily paperwork orientated area of the business they’re going to need a desk to get the job done properly, so consider the number of staff that are going to need their own desk to work at. If your staff members alternate between desk work and other tasks then you may be able to provide less desks that are shared; but consider the maximum number of people that will need access to a desk space at any one time. Chairs. Comfort is important to productivity. The right desk chair can have a big impact, but even if your employees aren’t working at a desk during the day there should be a place where they can take a seat every now and then, even if this is provided in a break room. Tables. Not quite like desks, but important. Consider a working environment. There might be display tables for products if your office is likely to have customers coming in and out, or a waiting room table with magazines and newspapers. Your employees might have tables set to the side of the offices for keeping certain items separate and so on and so forth. Office Partitions. 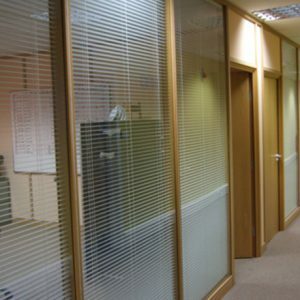 If there are going to be a few people in the office environment who are likely to need a little bit of peace and quiet in order to do their work effectively then you are going to have to consider partitioning between the desks, depending on the layout of your desks and the number of employees. 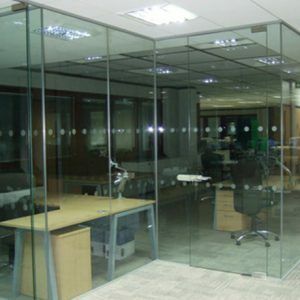 There are a wide range of partitioning options, from full length partitioning that can be used to provide each employee with a small cubicle of their own, to smaller and more attractive partitioning that still allows for communication and interaction between your employees. Office Storage. When it comes to an office environment there are a wide variety of storage needs to take into account. There’s the paperwork, resources, spare equipment and office supplies that all need to be kept somewhere where they can be accessed as and when needed. Consider cabinets, shelves, drawers and even underfloor storage solutions, as these will help you to conserve space while optimising your storage options. If you put in the time and effort to carefully planning the design of the office and placement of the office furniture then it shouldn’t take too long to actually get to the point of putting it together. Get the electrics in place. If you have planned where all of your desks are going to go then you should know where you need power extensions available, network cables, phone plug-ins and so on and so forth. So ensure all of this stuff is in place before you start bringing in the furniture. Get the big stuff in. It’s harder to move something big around a lot of small things than it is to move a lot of small things around a few big things. Bring in bigger items like shelves, desks, tables and storage units first – then when the little stuff like the chairs, computers, phones and devices come in you can put them straight into place without any issues. Blank grey walls are not interesting, and won’t do much to motivate your employees. While they probably will decorate their working environment themselves over time you can offer posters and paintings that provide some colour and enjoyable imagery to the space, which does help to increase productivity and make the office a more enjoyable environment for your employees. Plants, company displays and ornament type decorations can also be effective for presenting an attractive and professional appearance to the office environment.